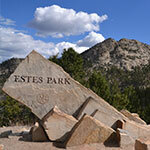 Newcomers to Estes Park might find themselves a bit overwhelmed when they first arrive. From the staggering beauty of Rocky Mountain National Park to the countless activities our quaint mountain village offers, you might not know where to begin. Here at Rams Horn Village Resort, we’d like to extend a little guidance and recommend a few things you can do during your trip in the winter months. Looking for adventure? Enjoy skiing on immaculate, untouched snow? Rocky Mountain National Park offers some of the best backcountry skiing in Colorado. The Hidden Valley Ski Area halted operations in 1991, so there are no ski lifts available, but anyone not deterred by a little hike will be rewarded with dreamlike, fresh powder unfound at popular ski resorts. The Hidden Valley offers around 1,200 acres of skiable backcountry terrain that will satisfy any enthusiast. Close by, the areas around Bear Lake also promise pristine snow for skiers and riders. Although it requires more steep hiking than Hidden Valley, there is a reason it’s become a favorite spot for skiers and boarders alike. 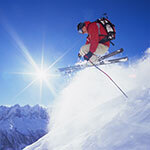 While the ungroomed snow offers some of the best riding around, it is important to be prepared. Everyone is encouraged to keep track of changing weather conditions, be aware that avalanches are a possibility, and be sure to have the proper equipment backcountry skiing requires. Otherwise, get out there and shred on the clouds of powder Rocky Mountain National Park has waiting for you. With hundreds of unique, local shops, breweries, galleries, and restaurants, downtown Estes Park is famous for having little bit of everything for any visitor. Take a stroll down Riverwalk and peer into the independently owned stores, guaranteed to peak your interest. Artists have always traveled to the mountain landscapes to find inspiration and Estes is no different, only in a class of its own. 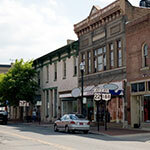 The town has multiple galleries highlighting the work of local painters, photographers, glassblowers, and the like. With strong roots to Native American culture, many artists are able to celebrate their history, as well. After taking in the unique creativity that our town harbors, stop by one of our many local breweries where the beers are always refreshingly cold, and make for a perfect drink companion as you soak in the scenery. With countless restaraunts adorning the streets, it is no wonder that Main Street has also become a gathering spot for foodies from around the world. Whether you’re looking for a mouth-watering burger, or just a light salad, there is no way that you won’t find what your stomach is growling for. Walk around long enough and you’re likely to run into an elk ambling down mainstreet like that’s where it belongs, because it does! With so many options, everyone can find a memento to take home, a meal to write your family about, or a locally crafted beer or wine to dream of later on. One thing is for sure, you may leave Estes Park, but you’ll always carry the memories with you. Even though the area is blanketed in snow, that doesn’t mean the hiking season is over and you should hang up your boots. Snowshoeing is rapidly becoming a favorite winter activity, and there is no better place to do it than Rocky Mountain National Park. Take in the breathtaking views, walk by frozen waterfalls, and witness the local winter wildlife in their natural setting. The Park has countless trails, promising unforgettable hikes through our winter wonderland. 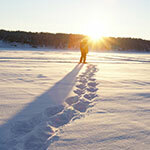 Snowshoeing is the perfect activity for those with an adventurous spirit. Incomparable backcountry skiing and snowboarding aren’t the only thing that Hidden Valley has to offer. The bottom of the closed ski area has been transformed into a sledding and tubing hill promising thrills and fun for visitors of any age. 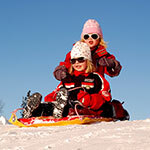 The hill is open at 10:00 AM to 4:00 PM everyday, and although it does require that you bring your own sleds, these are available to rent in multiple shops throughout Estes, but for those lucky enough to stay with us at Rams Horn Village Resort, we offer sleds free of charge. So get the family together, bundle up, and go have the time of your life racing each other to the bottom of the hill surrounded by the breathtaking wonder of nature. 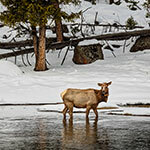 One thing that Estes Park and Rocky Mountain National Park is known for is our vast array of wildlife. From the little critters, to our ubiquitous elk population, visitors have a very high probability of spotting some of our wildlife residents as long as they keep their eyes peeled. Whether snowshoeing through the Park, or just walking downtown, you’re likely to see coyotes, elk, and more! Along with the beauty and splendor of the region, Estes Park is also very rich in history. Originally inhabited by the Arapaho, Ute, and Apache Indians, the town was then founded by Joel Estes in 1859. The beauty of the surrounding areas began to pique the interests of visitors, and Estes Park began to transform into what it is today. The museum offers multiple exhibits portraying the way of life in Estes’ humble beginnings, as well as steam cars, vintage clothing, and many antiques. 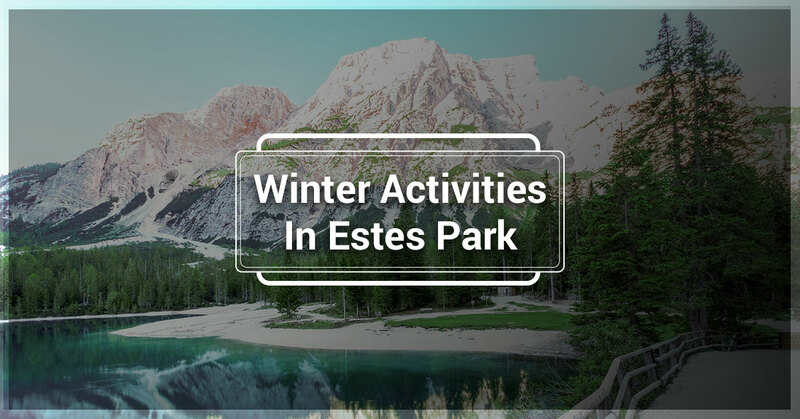 The museum is a perfect activity for the whole family, or for history buffs that would just like to learn a little bit more about Estes Park and Rocky Mountain National Park. Want the kids to learn a little bit while on vacation? Sign up for the winter ecology walk and snowshoe with a ranger! Available for anyone over the age of 8, the program will teach you techniques to traverse the various terrains found in the area, as well as how the various plants and wildlife survive the winter months using specific survival skills. The ecology walk is an educational program that is fun for the entire family! Estes Park is unlike any place you’ve been before, it is truly a piece of heaven found within the wondrous Rocky Mountains. Whether you’re planning on becoming one with nature and riding the unspoiled mountain snow, or just stay warm in your luxury cabin with your nose in a book. The choice is yours and your options are endless. At Ram Horn Villages Resort, we’re a mere mile away from the main entrance of Rocky Mountain National Park, and only two miles from Estes Park, so your next adventure will be in your backyard. Check availability now and come see what this beautiful, historic mountain village has waiting for you.